Michael Rakowitz tackles homelessness with a portable shelter made from plastic trash bags, packing tape and a plastic tube. 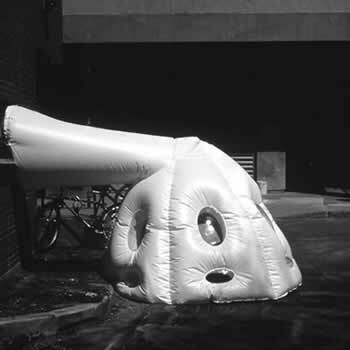 Connecting to the outtake vent of an existing structure, the structure inflates creating warmth, moisture protection and the notion of place all through a deceptively simple construction of materials. The trickle-down theory is turned outside in when residual heat connotes paradise. Mobility must be the key to happiness for Amy Franceschini as tote bags stretched onto metal poles are seen as ideal shelter for their ease of dismantling and inability to provide security. A continuous video projection of the portable street fair structures of a Hong Kong market accompanies Destiny Module, a chair/backpack designed by Franceshini to provide a supposed essence of home. The implicit reduction of capitalist trappings perhaps explains the perception of nomad as ideal. Loopholes in local building codes become the source of inspiration for architect Santiago Cirugeda, as he finds the extra room for urban space in the residual, temporary and forgotten. Heavy metal dumpsters normally rented by the day for the disposal needs of construction crews are filled with grass, dirt and seesaws to create playgrounds of bucolic pleasure. 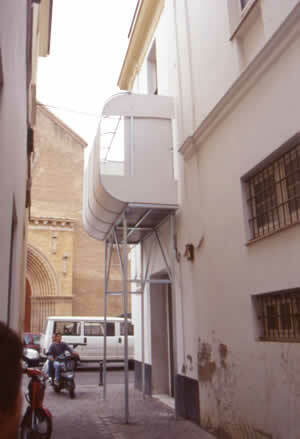 Scaffolding provides structure for the metal cladding needed to shelter one, in a small building that clings to the side of a building like a barnacle. The ingenious wit of these projects puts a smile on the face of utopia, something done quite well by youthful idealism of the sixties (Archigram) but in general missing here. Utopia Now is a simultaneous presentation of a hopeful, Wizard-of-Oz immediacy (If I ever go looking for my hearts desire again, I wont go looking further than my own backyard) with a resigned note of subterfuge, an underlying sense that these utopias will be swept away by the powers that be at the earliest chance. These elements certainly tap into a cultural pulse of sorts in that recent works in two different shows at Southern Exposure could easily have fit the Utopia agenda. SF Sites and Expeditions, a show of works exhibited outside of the confines of the gallery, included small plots of endangered wheat fields planted by artist Moriah Ulinska in disused spaces of San Francisco. These tiny fields, often only three feet square, will be harvested in February and the seed will be donated for redistribution. The previous show, By-product, displayed works by designers created for experimentation rather than profit. Numen.net (Ella Delaney and Eugene Marsh) outfitted a standard Rubbermaid storage unit as housing for one to make the Human Storage Unit. Surely this qualifies as an “impractical scheme for social improvement” but hardly as the “place of ideal perfection” I had once envisioned a utopia to be. — Donna Schumacher is an architect, artist and writer in San Francisco.